How do I add customers from an Autoresponder to a Campaign? While Tatango can't take customers' mobile phone numbers that have interacted with your Autoresponder and put them in one of your campaigns, you can give customers the option to subscribe to one of your campaigns after they receive your Autoresponder response. To do this, you'll first want to create a Campaign, and an SMS Keyword for that campaign. 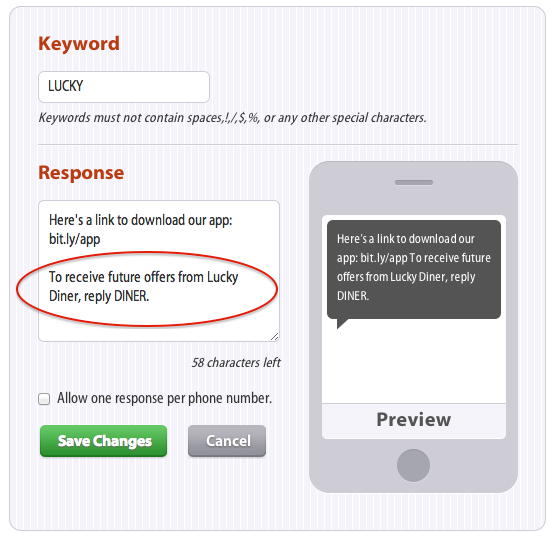 Then you'll want to instruct customers in your Autoresponder Response Message to reply with your campaign SMS keyword in order to opt-in. You can see what this would look like below, where the Autoresponder keyword is "LUCKY" and the Campaign Keyword is "DINER". Your customers will have to respond to your Autoresponder Response with your Campaign SMS Keyword to subscribe to your campaign. When they respond with your Campaign SMS Keyword, they'll receive whatever your opt-in message for your Campaign is, or if you've setup a double opt-in for your campaign, it will ask the customer for whatever required information you're asking from them, before they're opted-in.